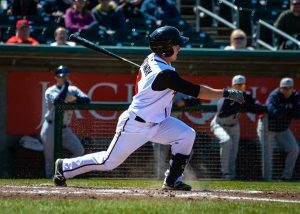 Using his versatility to his advantage in professional baseball, infielder Aaron Attaway is on the right track to earning more playing time in the future. Finding that time shouldn’t be an issue as Attaway currently plays three positions; With the ability to man second base, third base, or shortstop on any given night gives him an advantage over others in the organization. But it doesn’t matter to Attaway where he plays as he admits he always gives his all every night he’s in the lineup. Playing primarily at second base last year, Attaway logged 283 innings at the position between low-A and high-A ball. The prospect maintained a .975 fielding percentage at second, as he assisted on 80 plays, and took part in 13 double plays on the season. Transitioning to play third base in professional baseball, Attaway recorded 43 innings at the challenging position in 2016. Despite the small sample size, the prospect looked comfortable at the hot corner as he susccessfully converted nine of his 10 chances there. Attaway believes the biggest difference between playing second and third is the timing you have to make plays. One of the toughest parts of the professional game for Attaway so far in his career is finding consistency at the plate. Finishing 2016 with a .206/.291/.290 slash line wasn’t completely ideal for the young infielder, but despite the lower numbers he showed some pop in his bat. Recording eight doubles, a triple, and a home run in his 32 hits on the season showed some potential that could play up the levels with more opportunities at the plate in the near future. Crediting the quality of pitching for his inconsistency at the plate, Attaway talks about the transition of going from college baseball to the professional game. With this attitude towards his offensive game it won’t take long for Aaron Attaway to figure everything out at the plate and make continual progress in the Toronto Blue Jays system.